I was one of many Liverpool fans pretty gutted when the realisation that Nabil Fekir actually wasn’t going to sign kicked in. Like everyone else, I was glued to a screen on #FekirFriday, gleefully retweeting as James Pearce and Paul Joyce shared ‘Deal Done’ updates. Of course, they’d assumed the fully fit France international, who’d played 88 times the past two seasons, scoring 37 goals, would pass his medical… but how wrong they were! Liverpool pulled out of a deal to sign the playmaker as a result of an underlying knee issue and once pre-season kicked in, Jurgen Klopp decided to go with what he already had, having already signed Naby Keita, Fabinho, Xherdan Shaqiri and having watched the development of Curtis Jones. 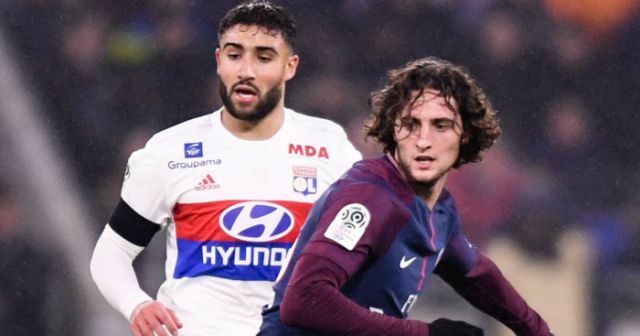 But heavy links to Adrien Rabiot have now emerged and it appears Fekir’s France international team-mate has climbed above him in Jurgen Klopp’s transfer pecking order. The 23-year-old is out of contract at the end of this season and is available to approach on a Bosman come January, with Klopp already reaching out to his representatives, according to ESPN. Rabiot is perfectly accustomed to playing a creative, but all-purpose role in a 4-3-3. He thrives in one of the positions ahead of the anchorman in which he can link defence to attack, drive forward and use his vision to make chances for the sensational forwards ahead of him. Fekir on the other hand, while brilliant, performs best as a no.10. Liverpool would have had to change our shape to accommodate Fekir in his best role, as he doesn’t have the positional or defensive nous to play a no.8 role in the 4-3-3. Obviously Liverpool’s front-three spots are taken, so Fekir would have had to be utilised elsewhere, and for the £60m-odd it would have cost to buy him, he surely wasn’t going to be a sub. This one’s pretty obvious. Liverpool can either get Rabiot, who’s still very young, for a reduced fee in January or for nothing at the end of the season. Fekir would have cost big bucks, which when you combine with his knee issue, is a much, much bigger risk. Despite the arrival of Naby Keita, I’d still argue that Liverpool’s midfield lacks a player with guile and composure who can either put his foot on the ball and slow down tempo, or speed it up. Jordan Henderson lacks this intelligence, Gini Wijnaldum has great close control but rarely creates something far in front of him, while James Milner’s incredible toil doesn’t fully hide his lack of intricacy. The idea of Fabinho holding, Keita given licence to roam and Rabiot dictating, is beautiful. Obviously this is highly hypothetical and discounts our other excellent midfielders, but the Fabinho/Keita/Fekir trio that was hyped over the summer actually lacks balance. Rabiot provides it in abundance. In Xherdan Shaqiri, Liverpool already have a physical, versatile, technical, left-footed attacker. Is this not the role Fekir may have taken should he have arrived? The Swiss was phenomenal during the summer, to such an extent that Klopp may have realised he already has an attacker of this mould available. Rabiot is a totally different entity and provides attributes our midfield currently lacks. So the deal makes sense on plenty of levels. What’s more, I think Klopp will get his man. Time and time again over the past year we’ve seen when our manager beelines for a player, they end up in red. The long-term nature of the deal suits the boss, too, and reminds me of when we secured Keita a year in advance. Rabiot has spoken very highly of Liverpool in the past and persuading him of our project shouldn’t be too tricky.